Process discovery techniques return process models that are either formal (precisely describing the possible behaviors) or informal (merely a “picture” not allowing for any form of formal reasoning). Formal models are able to classify traces (i.e., sequences of events) as fitting or non-fitting. Most process mining approaches described in the literature produce such models. This is in stark contrast with the over 25 available commercial process mining tools that only discover informal process models that remain deliberately vague on the precise set of possible traces. There are two main reasons why vendors resort to such models: scalability and simplicity. 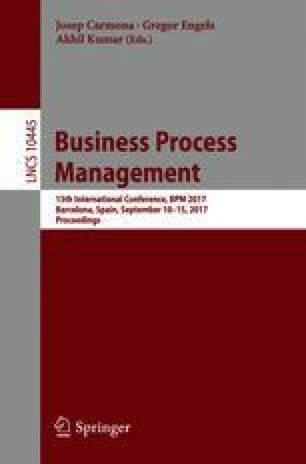 In this paper, we propose to combine the best of both worlds: discovering hybrid process models that have formal and informal elements. As a proof of concept we present a discovery technique based on hybrid Petri nets. These models allow for formal reasoning, but also reveal information that cannot be captured in mainstream formal models. A novel discovery algorithm returning hybrid Petri nets has been implemented in ProM and has been applied to several real-life event logs. The results clearly demonstrate the advantages of remaining “vague” when there is not enough “evidence” in the data or standard modeling constructs do not “fit”. Moreover, the approach is scalable enough to be incorporated in industrial-strength process mining tools.